There are rumors of underground passages that are said to lead to and from Hyrule Castle. When the castle was overrun by hostile forces, the royal family reportedly used them to escape. During Link's time, the vast Light World included a variety of terrain and climates, ranging from a desert in the southwest to a swamp in the south to foreboding mountains in the north. 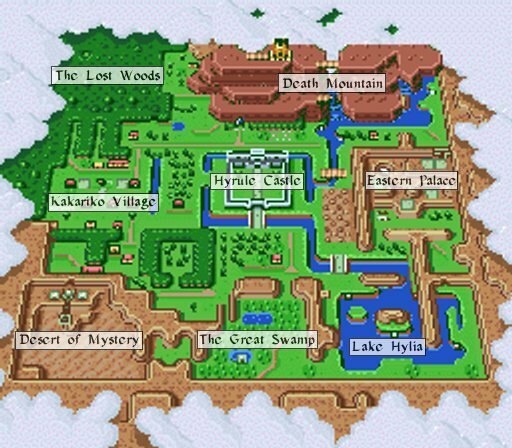 Society centered around Hyrule Castle, near the center of the land. Bridges and well-traveled paths connected the different areas, and innkeepers, shopkeepers, blacksmiths, and lumberjacks plied their trades in Hyrule, much as they did in neighboring lands at the time. Hyrule Castle: Hyrule's royal family occupied Hyrule Castle, which was built of huge stones quarried by Hylian subjects. The Lost Woods: The Lost Woods are inhabited by pesky thieves who prey upon any travelers who happen into the area. Kakariko Village: Cottages line the quaint cobbled streets in this village, and a large weathercock stands in its park. Eastern Palace: The architecture of the Eastern Palace is modest in comparison to Hyrule Castle. It is guarded night and day by Armos Knights. The Great Swamp: Crumbing ruins in the Great Swamp attest to the existence of an earlier civilization there. The Desert of Mystery: A stone monument that leads to the entrance of the Desert Palace is inscribed with ancient pictographs. Lake Hylia: In some places, Lake Hylia is very shallow, but in others it is too deep to measure. Unpredictable currents and Zora's Spawn make it unsafe for most swimmers. Death Mountain: The highest point in Hyrule is Death Mountain in the north. Mountain climbers come from all over to test their skills here, but few have reached the summit. This page was last edited on 18 August 2007, at 18:00.